Cooking is not my strong suit. I only enjoy two types of cooking. 1–The kind where you can toss a few things into a crock pot and it cooks itself. 2-The kind where you have 4-5 recipes that you’ve mastered and you fix those consistently. Years ago, I came across a recipe that met both criteria. Oh, Happy Day! If I’m sharing a recipe here (a rare event), you’ll know it is simple, cheap, and tasty- win, win, win! 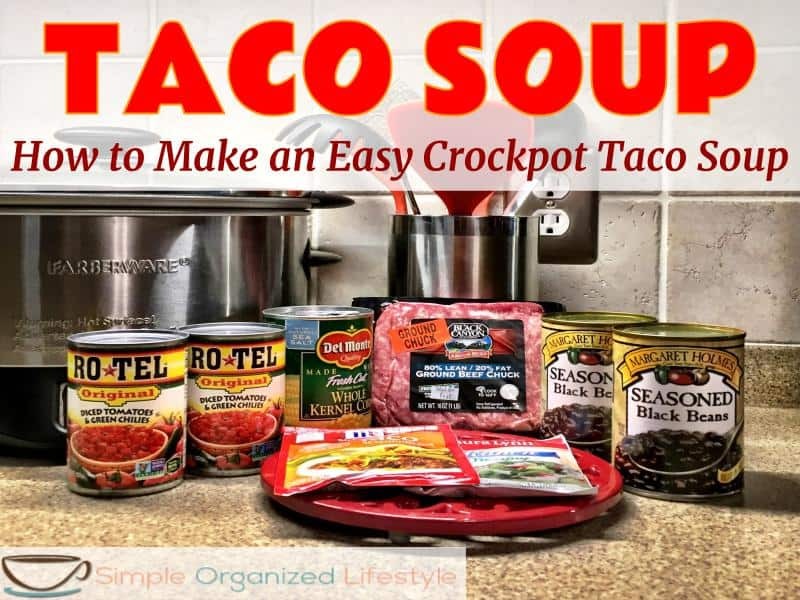 *If you double it, it makes what my grandmother calls a “wash pot” (aka A LOT) of soup for a big gathering, or enough for like a Duggar taco soup size family. *Freeze it!!! Make a wash pot, freeze several servings, and then pull it out all winter long. Time saver! *All kinds of variations work for different tastes- different beans, regular or mild seasonings… and we’ve substituted chicken for the ground beef on occasion too. *It’s a meal in itself, no sides needed. Friends, if you haven’t tried taco soup, you are missing out! 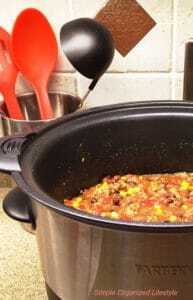 Some people call it 5 can taco soup, 8 can taco soup or chili taco soup and you’ll find some variations, but they are all simple and easy. It’s our family’s go-to recipe! This is my absolute favorite part to say- Dump everything listed above (no draining, except the meat) into the crock pot! Cook on high 2-3 hours or low 5-6 hours. Serve with the tortilla chips or corn chips, shredded cheese and sour cream. Jalapeños if you’re a fan of hot and spicy. I’ve never tried the Paula Deen taco soup recipe, but it gets great reviews. Basically, she adds onions, olives and uses diced tomatoes with a separate can of green chiles… but rotel combines the two so that works too. What is your family’s simple and easy go-to recipe?